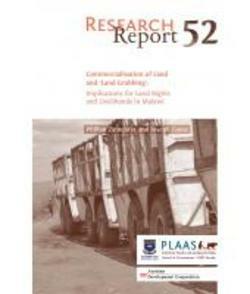 This study investigates the processes and impact of commercialisation of land in Malawi – specifically the acquisition of huge tracts of communal lands by foreign companies and local elites for sugarcane production in Nkhotakota and Chikwawa districts. The main finding was that ‘land grabbing’ for large-scale commercial agriculture in these two districts negatively affected the livelihoods of the poor communal farmers. The costs to the affected communities outweighed the benefits. In the two districts studied, land grabbing was driven by a weak communal tenure legal framework and the Malawi government’s support for large-scale agro-investments. The key players behind land grabbing were local elites, traditional leaders, foreign companies, international agencies, the coercive apparatus of the state – the police and army – and politicians. The land acquisition processes in both districts were violent and arbitrary, with no compensation offered to the displaced communities. The way in which the land was acquired resulted in the destruction of people’s properties, crops and household incomes, leading to increased food insecurity and poverty among the rural poor. Even though Malawi is a signatory to international land governance frameworks, there was a disjuncture between policy and practice due to the players not complying with the statutes.